It was small, worn, crowded and wonderful. 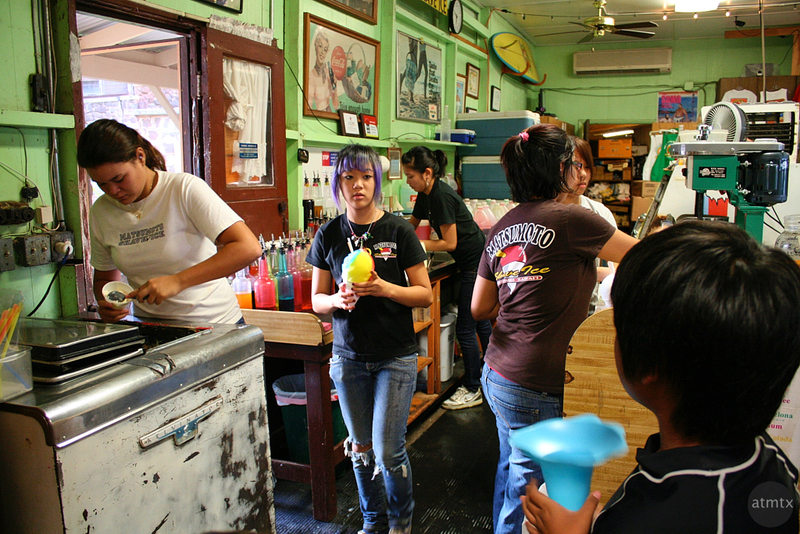 The famous Matsumoto Shave Ice in Haleiwa, on the North Shore of Oahu, Hawaii. This is how it was, back in 2008, during our first family visit. Last summer, we went there again and everything was different. Instead of this character filled place, a modern structure, made somewhat to fit the local vernacular, took its place. Surrounding Matsumoto’s was a mini mall of sorts with galleries and other eateries. Pleasant, but not the same. It was popular, no doubt, but the old place felt authentic — like a hidden gem known only to locals. A destination worth going to, from the other side of the island. The new one seems less worthy and less special. It is ordinary. And maybe the shaved ice is just as good, I don’t know and I don’t remember, but the total experience is diminished. I found this image last night, as my son and I browsed through my vast collection, looking for baby pictures. The power of photography to freeze time, space and re-experience memories. Shot with my first serious camera, the 8MP Canon Rebel XT DSLR. Part of my Travelgram Collection.